Material: Patient Belonging Bag (Rigid handle) is made with virgin LDPE. 2. An easy-to-use snap-locking loop handle keeps the personal belongings bag securely closed. 4. 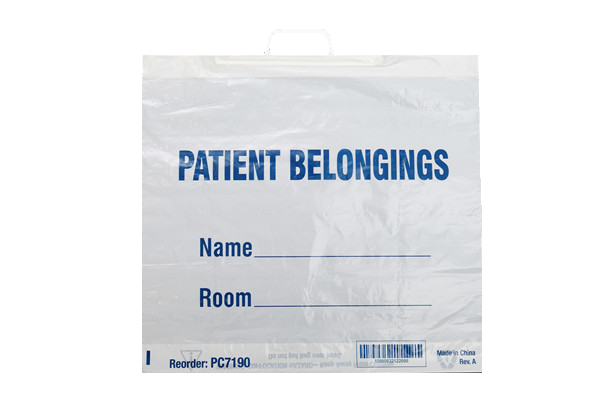 With feature space for the patient’s name and room number on Patient Belonging Bag (Rigid handle). 6. Customer logo can be printed on Patient Belonging Bag (Rigid handle). 7. Patient Belonging Bag (Rigid handle) passed FDA approval. 8. Leyi factory pass the ISO 9001 & 14001, and BV social compliance audit. 2. Standard exportation carton. Shipping cartons are printed “Patient Belongings Bag” in addition to bar code/UPC number, specification information and more.